As I partook in that great banquet—a tiny bite and sip of Infinity—I reflected on the hardened crumb in my left hand. It became for me an icon of our Lord’s chosen vulnerability. On Saturday, we ordained a new deacon and a new priest at the cathedral where I work. The diocese‘s new Canon to the Ordinary, Stefani Schatz, delivered the homily. She urged not only the newly ordained but all baptized Christians to pattern their lives after Christ. Among the features of that pattern, she named love, and described it as a vulnerability. Love does make you vulnerable, and we see that nowhere so clearly as in the Incarnation. In joining the human nature to the divine, God the Word became that most vulnerable of all God’s creatures: the human baby. Unlike other species, we humans remain helpless and fragile for years, doing the energy-intensive work of wiring up our brains while our animal cousins are mastering the hunt or achieving sexual maturity. We, instead, still live with our parents who dress us, feed us, and protect us, because we can’t defend ourselves. Willing in love to unite God’s creation with God in eternal wedded bliss, the Logos—the very Wisdom of God that sparked the Big Bang—entered the creation in need of human parents to change his diapers and burp him after feeding. He grew, but not into the kind of man our own culture would encourage or admire. He pushed back at all temptations to worldly success, opting instead for the true power of vulnerable love. That choice got Jesus killed, as we all know. The Roman world saw this as a clear mark of failure. But as early as St. Paul, Christians were foolishly claiming and proclaiming that shameful death as the way of salvation. The vulnerability and self-giving that had characterized Jesus’ life and led him to his death is the same pattern through which the Triune God loved creation out into being and is now, in Christ loving it back into union—unity-in-diversity, not dissolution of difference—with God. Jesus’ death wasn’t merely reversed in his Resurrection. 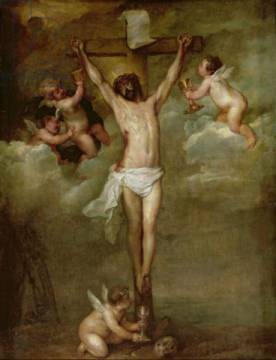 Rather, his Resurrection reveals the power of that love which has scandalously joined, for all eternity, the human and divine natures. The risen Christ reveals to us what our death, that ultimate ecstasis, now leads no longer to the extinguishing of the self into nothing but to a rebirth into a new kind of being. Anticipating that new kind of being, Jesus, “on the night before he suffered, instituted the Sacrament of his Body and Blood.” Somehow, in a mysterious way we can’t fully understand because we have nothing else to compare it to (it being only possible for the One who alone is fully God and fully human)—somehow, in the Eucharist, Christ comes to us in another most vulnerable form: under the species of bread and wine. On Saturday, as I knelt at the altar rail to receive Communion, I noticed a sizable crumb—well, morsel, really—of the home-baked bread we use for the Eucharist every Sunday. It was nearly wedged behind the kneeler cushion. Had it been there since the most recent Sunday, or longer? Being a sacristan through and through, I picked it up for proper disposal. It was crisp as a crouton. I held it in the palm of my left hand, my right hand placed over it to receive a fresh morsel. As I partook in that great banquet—a tiny bite and sip of Infinity—I reflected on the hardened crumb in my left hand. It became for me an icon of our Lord’s chosen vulnerability. Bread that is broken and shared is also easily wasted, spilled, stepped on, or left to harden behind a kneeler cushion, despite our best intentions. That little bit of consecrated Bread was no less potent, no less “the Body of Christ, the Bread of Heaven” than all the other bits that did make it onto communicants’ tongues, to be mashed between and into their teeth, and swallowed like ordinary food. But there it was, unused, lost, forgotten, stale. A symbol of the prodigally vulnerable and abundant love of God, willing to risk, to accept such waste in the course of distributing spiritual food to us needy people. 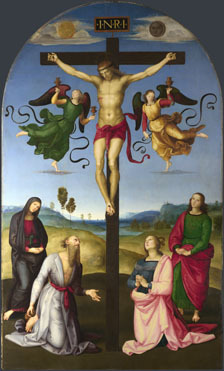 Many paintings of the Crucifixion didactically depict angels collecting Jesus’ blood in little chalices. Yet no one would deny that Jesus’ blood actually soaked into his Cross and spilled into the dirt. Ancient peoples, including the ancient Hebrews from whom Christ and his disciples descended, believed that blood was the seat of life. As such, it possessed great power. 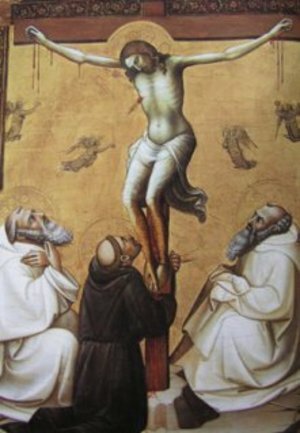 In sacrifice, that blood was released, and could be manipulated to ritually cleanse, consecrate, and give life to others. 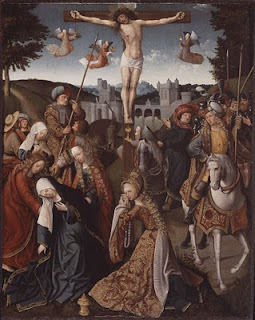 That metaphor was applied early on to Jesus’ death: the shedding of his blood released the power of his life to be applied to us, in much the same way ancient priests had sprinkled blood on the people in various liturgies. What, then, does it mean that such power should fall into the dirt? As Jesus continuously demonstrated during his ministry, when the holy or pure comes into contact with the unholy or impure, it isn’t tainted. It consecrates. It makes the impure pure. It transforms death into life, sickness into health, hatred into love, fear into peace. Light shines in darkness and it is not overcome. It’s completely backwards to our human way of thinking, but it isn’t magic. It’s the actually real, normal course of things: it’s God loving creation back to Godself. We handle the elements of the Eucharist with respect not because they’re magical and would bring harm to us otherwise. There’s no seven years’ bad luck for spilling Communion wine. Rather, we treat these elements with respect because God has honored our prayer to “sanctify them by [God’s] Holy Spirit to be for [God’s] people the Body and Blood” of Christ. That’s a pretty amazing gift, one that certainly shouldn’t be tossed into the trash or poured into the sewer system. But in choosing bread and wine for the Sacrament, and telling us to share it, surely our Lord foresaw the inevitable and eventual crumb in the kneeler cushion or wine stain in the limestone floor. (Well, maybe he didn’t foresee such things as kneeler cushions, but the point stands.) Like the sower in the parable who scatters seed on the rocky, hard, and thorny ground as well as on the good soil, God is not ashamed or afraid to be profligate when dispensing grace. Rather, God places Godself into fumbling human hands. The potential for spillage is tremendous—but it also means you never know where you might find Jesus. This entry was posted in Theological reflection and tagged Communion, Eucharist, Love, Vulnerability. Bookmark the permalink.